Enjoying the anticipation that builds when binding a quilt. Waiting with bated breath to see if that initial vision that started the whole project will be realized. Will it say what it's supposed to? Will it create the response it was meant to? Is it what I wanted it to be? And, mostly, the excitement of seeing that finished product, the culmination of much deliberate intention: fabric, design, thread color, quilting, size, binding choices, batting, finally realized. Enjoying giving the quilt the last personal touch. 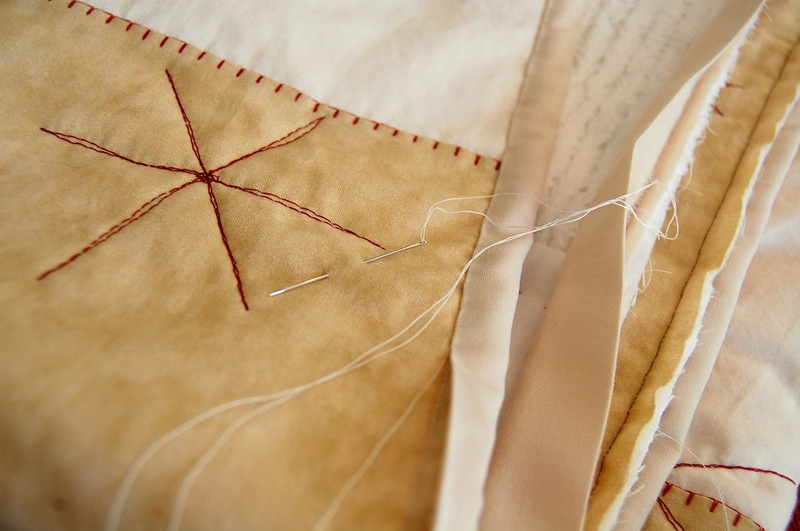 Even after many, many quilts I still pay attention to each stitch that goes into binding it. Enjoying the sitting and slowing down that hand-binding a quilt requires. For me, binding isn't something to be done when grumpy or agitated or in a hurry. It forces putting a few hours aside to breathe easy, enjoy the surroundings, and relax. Enjoying knowing that whether or not the quilt ends as it was meant to (they often take a turn in the road somewhere becoming something totally differently special) adding that binding is like adding a mat to a picture ... it's that finishing touch that makes it look good. A bound quilt always looks good to me.